If you have never volunteered on a PCRG project, you may have a lot of questions about what to expect. That's great, we love questions! Volunteering in any capacity and for any cause can be a rewarding and valuable experience. But getting to volunteer doing something you're passionate about and interested in? What could be better?! Based on over 20 years of experience running volunteer research projects, we have an idea of what you might be wondering so we've compiled a list below with some of our most frequent FAQs. Still not finding what you're looking for? No problem, feel free to reach out to us. The best reason to volunteer with PCRG is, ITS FUN! We strive to offer the best possible experience for volunteers to learn about all aspects of archaeological research and inquiry while also accomplishing our research goals. Our projects offer participants a chance to learn about the past and contribute directly to scientific research. You will meet and interact with people who have a shared interest in learning about the past and preserving that past for future generations. Students who volunteer with PCRG have the chance to build valuable connections and gain the necessary experience to find employment in the field of archaeology. Volunteers form the backbone of what we do as an organization. Without volunteers, none of our projects would be possible. We take great pride in seeing so many volunteers come back each year, often brining new faces with them! Volunteering is open to everyone and there is no cost to join a project. However, PCRG members get priority when applying for projects. Our projects often fill up so becoming a member is encouraged to ensure you the best chance of joining at least one project a year. Anyone with an interest is archaeology is welcome to volunteer. Most of our projects include a mix of seasoned professionals, students, and first-time volunteers. No experience is necessary; our staff will teach you everything you need to know! We ask that volunteers are at least 18 years of age. Some exceptions do apply, please contact us for more information. Participants will be involved in all aspects of the fieldwork. There usually is a brief orientation and training, but within the first day you will be in the field, doing archaeology! Field archaeology involves physical labor outdoors, including movement in and around open excavation units and across uneven terrain. Our projects take place in the summer months when the biggest concerns are overexposure to sun and heat. Please consider this when applying for a project. Some of our projects are more physically demanding than others, if you have any concerns about your ability to participate in a project please reach out to us before applying. Not every project is an excavation; some projects are survey which consists of walking different areas of land looking for resources on the surface, and recording new sites. Field days usually begin around 7am and end at about 4pm. 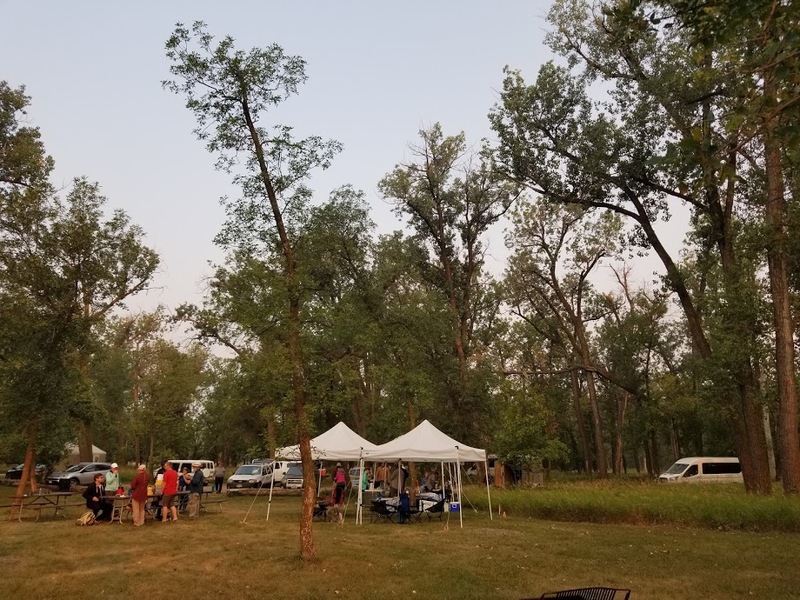 After a day in the field, volunteers return to camp where there is time to relax, eat, discuss the project and archaeology, and enjoy the evening. Most of our projects are in remote (or semi-remote) areas so we establish a basecamp. Volunteers stay in the camp with the rest of the crew (unless prior arrangements are made). You provide your own camping gear (including a tent, sleeping bag, sleeping pad etc.). Most camps do not have room to accommodate large trailers or campers so plan accordingly. Participants usually will arrive the night before the first field day. Most stay through the end of the project, but we understand this may not always be possible. PCRG provides all meals for the entirety of the project but you are welcome to bring personal snacks, beverages or other comforts from home if you like. Dinner will be provided the first night. Breakfast and a sack lunch will be provided on your last day. We can accommodate most food allergies, we will collect this information before the project begins. Every project and camp is different. More details about camp life, including required equipment/gear list and other logistics will be provided well in advance of the project. How Does That Sound? Ready to Hit the Field? If you are interested in volunteering with PCRG check out our current projects for a list of opportunities. If you have any questions feel free to contact us.